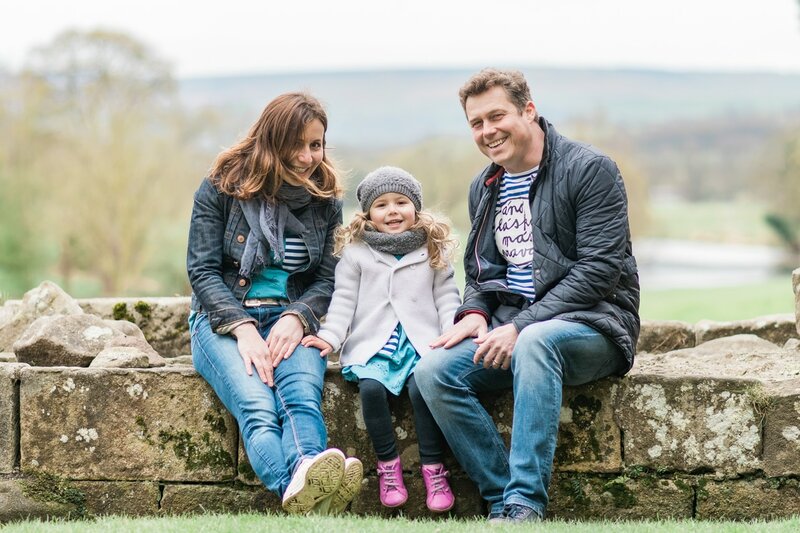 For the last few years I have been lucky enough to be able to take bookings for child/family photo shoots to take place on location in the stunning Bolton Abbey Estate and it's been my most popular photo shoot location with families ever since. I'm delighted to have this association with the Estate and their beautiful grounds and the Estate provides a fantastic backdrop for family photos with so many gorgeous areas to explore, from the Priory ruins, the stepping stones and the beach, to the beautiful and atmospheric Strid Wood. As far as locations go for photo shoots it just doesn't get much better than this, as well as it being such a fantastic place for children to enjoy and explore. As the Bolton Abbey Estate is privately owned, it places restrictions on commercial photography (as do all privately owned Estates), and as such it charges a fee for photo shoots to take place within its grounds. This is why my fee is slightly higher for Bolton Abbey photo shoots, but this additional charge goes directly towards the upkeep of the Estate for its many visitors to enjoy. The Bolton Abbey management have very kindly been keen to keep this location fee as low as possible for children's/family photo shoots with me as they are aware that it is such a popular spot with local families and that it would be a great backdrop for treasured family photos. as soon as I've finished selecting and editing your photos I will send you a link to your own password protected online gallery. This will contain the edited photos in both high resolution (with no watermarks), for your unlimited personal printing use, as well as lower resolution, web optimised versions of the photos which you can use if you want to put any on Facebook etc. The photos can be viewed and downloaded as many times as you want, so feel free to send the link around your family if they'd like their own copies too. I like to keep my pricing simple, with no nasty surprises. This is why I charge a fixed fee which includes both the photo shoot and the best 15 - 20 edited digital images from the day. Should you wish to purchase prints through me then you are able to do so easily online via your gallery, however you are able to get them printed anywhere you choose and certainly not tied in to me for prints. Please note that, if arriving by car, the usual car parking charges apply (usually £10 per vehicle depending on the season). Your parking ticket is valid all day and is transferable between the three separate car parks - why not make a full day of it and explore the rest of the Bolton Abbey Estate before/after your photo shoot! If you have an annual pass then you can of course use this as normal. Full details can be found on their website: http://www.boltonabbey.com/planvisit/prices.htm. If you'd like any further information or would like to go ahead and book a Bolton Abbey photo shoot, my Contact Me page has details for how to go about getting in touch with me.